Ratatouille is a combination of bell peppers, eggplant, zucchini, and tomato—produce that peaks at the end of summer. The result is a massive batch of vegetables that keeps well for days. Serve as a side for proteins like steak or chicken. 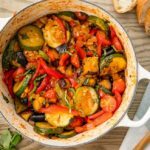 Ratatouille is a combination of bell peppers, eggplant, zucchini, and tomato—produce that peaks at the end of summer.